In this story we report on some issues GLFuzz turned up when applied to Intel’s proprietary drivers on Windows and Mac systems. We haven’t yet tested Mesa drivers for Intel GPUs. Desired image, on the left, turned into the nice-but-wrong image on the right, when “+ 0.0” was added to an expression. Fixed in recent Intel drivers. We’ve been reporting bugs to Intel from the start of the GLFuzz project, and they’ve been very receptive. Because Intel have fixed bugs identified by GLFuzz, the rate at which our tool finds bugs in their later drivers has gone down — this is the case with any fuzzer. The issue illustrated by the above image pair was one of the first ones we reported. This was with an Intel HD Graphics 520 GPU, and driver version 20.19.15.4326, under Windows 10. The modern art of bugs: wrong images rendered by Intel (left) and ARM (right) GPUs, from different original shaders, have a similar visual appeal! This is another example of “adding zero”, because we set injectionSwitch to (0.0, 0.1) at runtime, so that injectionSwitch.x is 0.0. So the change should have no effect (modulo floating-point round-off). Under Windows I get the black image using Firefox and Chrome (which use ANGLE), as well as using Edge (which doesn’t use ANGLE). This is interesting because it shows that the bug can be exposed via DirectX (recall that ANGLE translates OpenGL calls to DirectX on Windows, as this is typically more reliable than using OpenGL drivers). We have reported the issue to Intel. What’s the key difference between the original issue, where we added vec2(0.0, 0.0), and this issue, where we added vec3(0.0, injectionSwitch.x, 0.0)? The use of injectionSwitch means the compiler cannot optimise away the addition. It is possible that the bug that caused the first issue was not actually fixed, but rather the compiler learned to optimise away “+ vec2(0.0, 0.0)”. The compiler cannot optimise away “+ vec3(0.0, injectionSwitch.x, 0.0)”, because it doesn’t know statically what injectionSwitch will hold at runtime. What small change do you have to reverse in the fragment shader linked above to get this, instead of a black image? If you’ve got a similar Intel GPU then you might also see this bug, and it may well be present with other drivers. Challenge: based on our posts so far, can you spot the one-line, zero-impact change that GLFuzz has introduced to cause this issue? Clue: the issue is related to statements that affect control flow. Answer: Check out our issue on GitHub to find out. During our testing of Intel GPUs, we found three security-relevant issues. We’ll give a brief tour of these, but with responsible disclosure in mind we won’t provide instructions on how to reproduce! We have reported these issues to Intel. As usual, the shader he is attempting to render is one the GLFuzz has constructed from a human-written shader by applying semantics-preserving transformations. While these transformations can lead to a large and long-running shader that might miss its rendering deadline, one would hope that it should not lead to this kind of locking up behaviour. At 00:47 you can see evidence that this is definitely a rendering issue, because parts of the rendered image appear elsewhere on the Safari window. Interestingly, the desired image is actually rendered before the bluescreen occurs! The error code associated with the bluescreen is WHEA_UNCORRECTABLE_ERROR. Acccording to this Microsoft documentation: “This bug check indicates that a fatal hardware error has occurred”. We tried this on two different machines with Intel HD Graphics 520 GPUs, and got the bluescreen on both, so it seems unlikely to be due to a broken GPU. 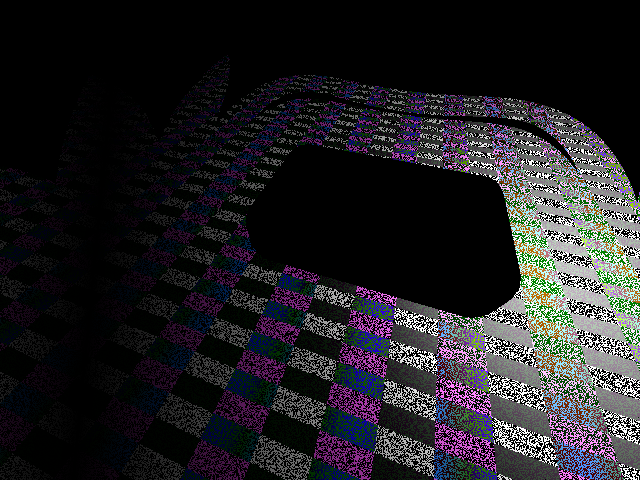 Unlike the bluescreen we reported in our post about AMD, we could not reproduce this one using WebGL. We’ve been having a fun time doing automated reduction of these bluescreen bugs, which is challenging and somewhat unnerving! I’ll write another story about that sometime. But although we found this and the AMD bluescreen using very large variant shaders, we were able to minimise these shaders to really small examples triggering the same issues.